I was sad to hear that my Greenwillow friend Jose Aruego passed away the other day. His youthful high energy at school visits belied his age. 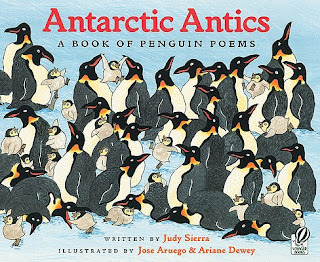 With Ariane Dewey he illustrated more than 60 fresh, funny, and original books including the bestseller Antarctic Antics, a book of penguin poems written by the multi-talented Judy Sierra. I find my father's feet are nice. And that's how I stay warm enough. Sorry to hear about your friend's passing, Douglas. He was very talented.